Stunning custom penthouse at the Stoneleigh Residences with panoramic views of the city! This 7500 sq. ft unit has designer finishes throughout with open and contemporary floorplan. Your own private elevator delivers you into the dramatic entryway with Ann Sacks Pearl Limestone flooring, lacquered white walls, and carved wood doors replica of 14th Century Italian. Magnificent dining room with steel and glass walls that separates yet still has views of downtown with Arteriors polished nickel chandeliers. The living room has coffered ceilings made of pecky cypress and opens to contemporary kitchen. Focal point of the living and kitchen area is a unique fireplace surrounded by polished bronze and designed by Robert Wohlfeld. Kitchen has designer cabinets done in hand scraped pine and painted in Marshmallow. Counter tops and backsplash in Keystone Arabescato Marble. Appliances are top of the line Thermador. Grand Ballroom/Party room has limestone flooring , elec. 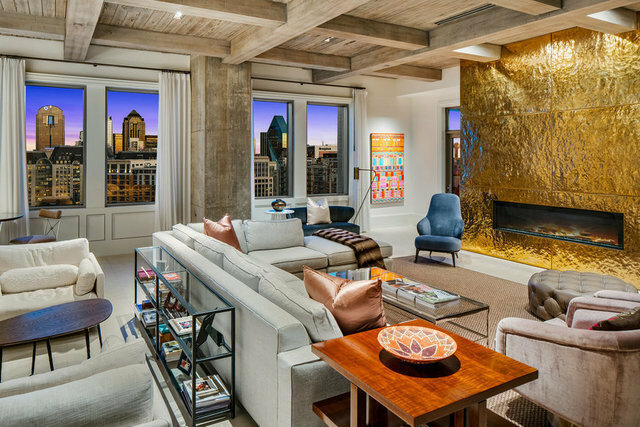 Shades, Lee Jofa wall covering, area for band, great wet bar and large covered terrace with spectacular views of downtown Dallas. Two beautiful guests suites each with fabulous views and their own baths. Bunk room with 6 adorable built in beds and bleached walnut floors. Playroom has Ouside the Box hand painted wall coverings and built in seating. Art studio with natural light and access to balcony. This unit includes 7 parking spaces and 2 large storage rooms!